I just love MissPrint wallpapers and have featured them on the blog before, so as we are basking in glorious sunshine I thought it apt to showcase another fine example from their Collection 2 – Garden City in Sunburst. I love the retro, rather groovy feel of the design. This one depicts stylised leaves and is inspired by the tree-lined streets of London. Available in several different colourways and, in fact, has quite a different feel depending on the shade. 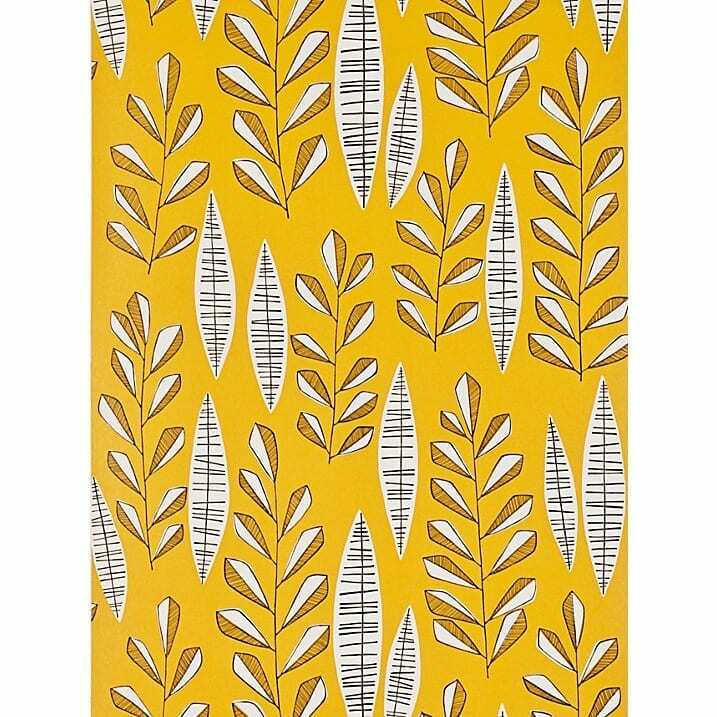 This one, of course is ideal if like me, you’re loving the yellow accent at the moment, and a great one for keeping that sunny feeling in the home all year round. Where could we put this one? Well to be honest, with the right accessories it could just about anywhere in the home. Use it in the lounge with a retro pale grey sofa and gloss white furniture, or in the dining room with a dark wood dining set and plum coloured accents. I’m very much liking the idea of this in my own kitchen actually on a feature wall mixed with dark grey walls and my dark blue mosaic tiles. Perfect. MissPrint Garden City is available from the MissPrint website itself or from wallpaperdirect.com for £59.95 per roll. Disclosure: This post contains an affiliate link which means if you subsequently purchase something from the site after using the link I will earn a small commission. LOVE this one Jen. I think I may have found the wallpaper for my dining room! Just ordered a couple of samples of the other colourways – thanks! Fabulous Emma! Glad you like it, some of the other colourways are really interesting too aren’t they, but I’m always drawn to the yellows at the moment.